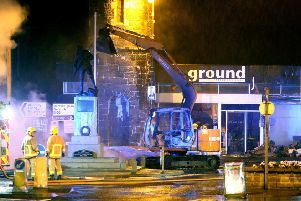 Two people were treated for smoke inhalation following an arson attack in Larne this morning (Thursday). Firefighters were called to a blaze in a semi-detached property at Craighyhill Bungalows around 1.15am. Extensive damage was caused in the incident at Craigyhill. A car was also on fire at the property. The Northern Ireland Fire and Rescue Service stated: “A man and woman in their 50s were out of the property on arrival of fire crews. They were both treated at the scene by fire crews and ambulance personnel for smoke inhalation and shock. Detective Sergeant Pete Crothers said: “Shortly after 1:15 am of today (Thursday, 07 June) it was reported that a petrol bomb had been thrown through the front of the house in Craigyhill. This caused extensive damage to it and also damaged the property next door. It is the latest in a series of attacks in Larne in the past week. During the early hours of Monday, a Mitsubishi car parked outside a property in the Inver area was set alight. And on Friday, June 1, a black Ford Focus car was badly damaged in what police are treating as suspected arson attack at Gloucester Avenue. Anyone with information is asked to contact police on 101, quoting reference 73 07/06/18. Alternatively, information can also be provided to the independent charity Crimestoppers on 0800 555 111.